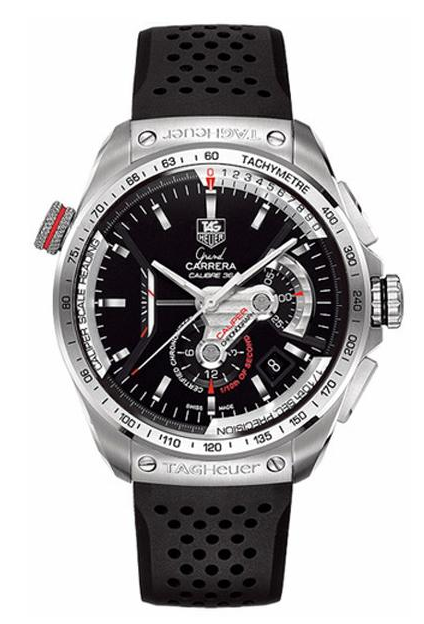 The TAG Heuer Grand Carrera CAV5115.FT6019 offers sleek style and accurate time measurement of 1/10th of a second. 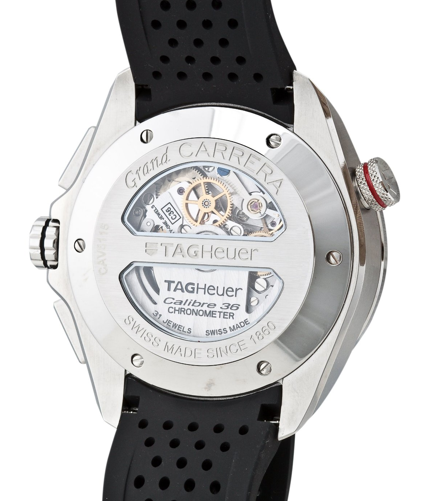 The back view of the TAG Heuer Grand Carrera CAV5115.FT6019. It shows off the award-winning Calibre 36 RS Caliper. There are a few aspects of the TAG Heuer Grand Carrera CAV5115.FT6019 that you should be aware of before purchasing. One, for instance, is that the water-resistent technology is not designed to last forever. It’s recommended that the watch be tested annually to guarantee that its rubber seal is intact and keeping water out. Eventually the outer coat of the dual-antireflective finish will naturally begin to wear off, and while the numbers displayed on the watch are readable, it can be difficult to distinguish the needles for each other since there are only two colors for three different needles (the 1-20 second needle is black as is the 21-40 second needle. The 41-60 second needle is red). There are also a few technical difficulties syncing the time to automatic time, for instance, some users have had trouble resetting the hour disc to zero. All in all, however, the TAG Heuer Grand Carrera CAV5115.FT6019 is a stylish, elegant choice that keeps excellent time and does not need to be adjusted regularly. This watch has won the Grand Prix de L’Horlogerie de Geneve Award as well as other notable awards and is undoubtedly both a luxury and state-of-the-art timepiece.